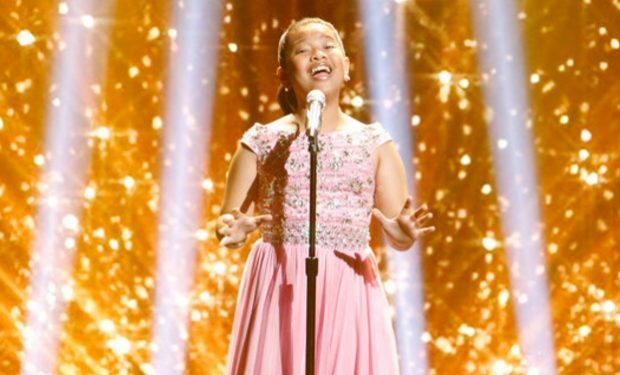 On Season 2 of Little Big Shots, host Steve Harvey goes crazy for 12-year-old singer Elha Nympha. And so will you. If Little Big Shots was a competition, and show creator Ellen DeGeneres says it isn’t, Elha would have a really good chance of winning. In 2015, she won the Philippines reality singing TV competition, The Voice Kids, and won a recording contract with MCA Music of Universal Music Group. Elha’s debut album, Elha, was released in October and includes her covers of Beyonce’s “Love on Top” and Sia’s “Chandelier”, among others. And yes, she proves she’s both a belter and whistler. Elha’s other tracks — the album has 13 tunes — include: “Emotions”, “Susunduin” (the Tagalog word for I’ll Pick You Up), “Go The Distance”, “You Raise Me Up”, “You Are Not Alone”, “You’ll Never Walk Alone”, “The Prayer”, “Ikaw Ang Lahat Sa Akin” (Tagalog for You’re Everything to Me), and “The Prayer”. Little Big Shots airs Sundays at 8pm on NBC.